Random House Trade Paperbacks, 9780812982534, 224pp. 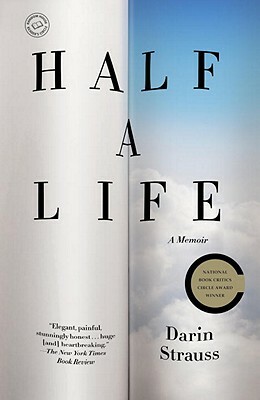 In this powerful, unforgettable memoir, acclaimed novelist Darin Strauss examines the far-reaching consequences of the tragic moment that has shadowed his whole life. In his last month of high school, he was behind the wheel of his dad's Oldsmobile, driving with friends, heading off to play mini-golf. Then: a classmate swerved in front of his car. The collision resulted in her death. With piercing insight and stark prose, Darin Strauss leads us on a deeply personal, immediate, and emotional journey—graduating high school, going away to college, starting his writing career, falling in love with his future wife, becoming a father. Along the way, he takes a hard look at loss and guilt, maturity and accountability, hope and, at last, acceptance. The result is a staggering, uplifting tour de force. Darin Strauss is the bestselling author of three previous books. The recipient of a Guggenheim in fiction writing and numerous other awards, Strauss has seen his work translated into fourteen languages and published in more than twenty countries. He is a Clinical Associate Professor of Writing at New York University, and he lives with his wife and children in Brooklyn.